Guangdong Yingbin Hotel, the main host hotel of Guangdong Provincial People’s Government, located in the interchange of Jiefang Bei Road and Zhongshan Liu Road the Commercial Center and the transfer station of the Metro Line 1 and Line 2, a 10-minute walk from Beijing Road, and the Buddhist Six Banyan Tower is in close proximity. Hotel has Baiyun Building and Bihai Building, including 263 luxurious guest rooms. After the bright and tasteful renovation in August 2007, with the elegant environment and bright rooms, guests can even enjoy the enchanting scenery in the spacious balcony of Deluxe Executive Suite and Deluxe Executive Room. In Chinese Style Restaurants, there are more than 30rooms in restaurants of our hotel with nice surroundings and graceful placement and all kinds of feasts and receptions can be held. And in Western Style Restaurant of Guangdong Yingbin Hotel, different cuisines will tantalize guests' discriminating taste. Guangdong Yingbin Hotel unites the facilities of a modern luxury hotel with a warm atmosphere and friendly and attentive service. 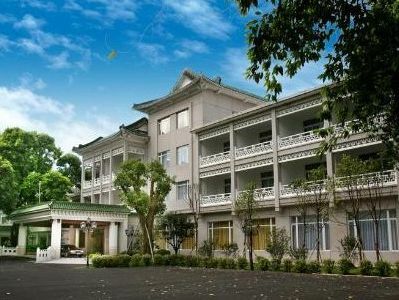 The Guangdong Guest House boasts 263 well-arranged guest-rooms for your relaxing and cozy stay in Guangzhou.